Experience the best of both worlds on your next Caribbean vacation, where your precious time is perfectly balanced between life at sea and ashore. Our Stay & Sail packages are an incredibly unique vacation experience that let you delve into the wonders of St. Lucia and its surrounding islands within one organized package – where the logistics and arrangements are all taken care of. For those who have a love for rich culture, beautiful tropical settings, adventure, and even a little romance, our Stay & Sail Martinique package in particular, is right for you! Cast off for 4 days of sailing on a skippered yacht reserved exclusively for your party to St. Lucia’s northerly neighbor – Martinique, an island full of Caribbean-inspired French culture, fascinating history, and delectable local cuisine. As for your 4 nights’ accommodations in St. Lucia, you have the choice to take these before or after the sailing portion of your trip. Regardless of what order you decide to plan your week, our Vacation Club Villas in Marigot Bay will make you feel right at home. Named “the most beautiful bay in the Caribbean”, Marigot Bay will have you dreaming away your worries and imagining yourself in simpler times. So whether you’re a seasoned sailor or just getting your first taste of salt, our Stay & Sail packages are a superb option for anyone looking for that truly unique and memorable vacation – where the land blends into the sea. 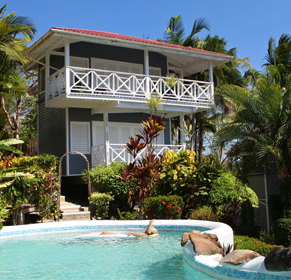 4 nights’ accommodations at one of our private, detached Vacation Club Villas in the beautiful Marigot Bay. 3 nights and 4 days of sailing north to the enchanting Martinique aboard our skippered 50′ Beneteau Cyclades reserved exclusively for you. Board at 9:00am on the day of your choice and leave 4 days in the afternoon. 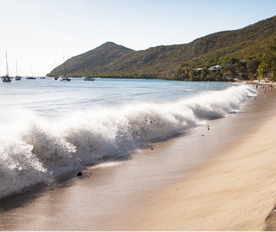 Come enjoy the majesty of Martinique how it’s supposed to be experienced – from both land and sea! Contact us today to check availability and details!